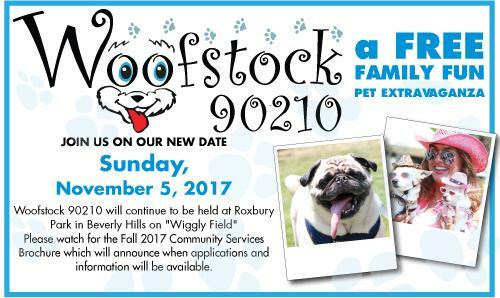 Woofstock 90210 will be held on Sunday November 5, 2017, from 11 am to 4 pm. A silent film production company and cast make a difficult transition to sound. Don Lockwood (Gene Kelly) is a popular silent film star with humble roots as a singer, dancer, and stuntman. Don barely tolerates his vain, cunning, and shallow leading lady, Lina Lamont (Jean Hagen), though their studio, Monumental Pictures, links them romantically to increase their popularity. Lina is convinced they are in love, despite Don’s protestations otherwise. Wildely acclaimed as the greatest musical of all time. Good girl Sandy and greaser Danny fell in love over the summer. When they unexpectedly discover they’re now in the same high school, will they be able to rekindle their romance? It’s California 1959 and greaser Danny Zuko and Australian Sandy Olsson are in love. They spend time at the beach, and when they go back to school, what neither of them knows is that they both now attend Rydell High. Danny’s the leader of the T-Birds, a group of black leather jacket-wearing greasers while Sandy hangs with the Pink Ladies, a group of pink-wearing girls led by Rizzo. Join LOEM for our adoption event, Saturday, May 27th 2017 @ the Malibu Country Mart from 11 am - 2 pm. Come meet our adoptable super dogs and see their extraordinary powers. VegFest Los Angeles 2017 will be held on April 30th, 2017 at Woodley Park in Lake Balboa (San Fernando Valley) from 10:30 am to 6:30 pm. We welcome attendees to a magnificent day filled with food, fun and inspiration. The combination of a delicious vegan international food court, great live music, empowering speakers on health, environmental, humanitarian and animal topics, kids’ activities, animal adoptions, an eco-marketplace with over 150 vendors, and more, make for an an unforgettable earth-friendly experience that is sure to be enjoyable for all! Join LOEM for our fundraising event, Saturday, April 22nd 2017 @ TBA from 9 am - 1 pm. More details to follow. Join LOEM for our adoption event, Saturday, April 8th 2017 @ PETCO from 12 pm - 2 pm. Come meet our adoptable super dogs and see their extraordinary powers. Join LOEM as we peddle away at Cycle House in West Hollywood. Saturday, April 8 from 8:30 am to 11:30 am. Sweaty or not, hang out with us and our super pups. Join LOEM for our adoption event, Saturday, March 25th 2017 @ the Malibu Country Mart from 11 am - 2 pm. Come meet our adoptable super dogs and see their extraordinary powers. VEGAN PIZZA + HOT DOG PARTY**! **Soft drinks included. Beer, wine and curated cocktails will be available for $5. "FASHION TAILS" ... held over by popular demand and featuring 10 newly shot photos for this event! Many of the celebrities who are featured in this creative and whimsical photographic exhibit will be present. Come take a photo next to a celebrity from one of your favorite TV shows! Curated by Eva Danielle, this exhibit was shot over the period of several years to highlight the need to "adopt not shop" and the flip side of adoption-- high euthanasia rates in our shelters and increased demand for puppy mills. PLUS special guest, Ugly Martin, who was liberated from a South Korean dog meat slaughter house and earned his name because the butcher claimed he was too ugly to eat. But Martin has found happiness since arriving here and is ugly no more! Come give him a kiss in our KISSING BOOTH (bring cash as Martin only kisses for cash)! Also come meet a few adoptable dogs brought to us from the League of Extraordinary Mutts rescue organization. Come see these two wonderful exhibits before they leave. And what better way to spend a Saturday then in the company of dogs and friends, viewing stimulating exhibits and supporting the FIRST ever animal museum in the nation! The museum exists to educate, inspire and empower change for ALL animals!